During my time working with the product, I have come to know and love these extensibility points, so when Steef-Jan contacted me to work with him and Johann Cooper on an e-book on this subject I was immediately on board. And today, after a lot of hard work, the e-book has been officially released, and can be downloaded from our friends at BizTalk360 for free. I hope anyone working with BizTalk will find this book to be a great resource. I want to thank everyone Steef-Jan and Johann for co-authoring the e-book. I also want to thank Sandro Pereira, Mark Brimble and James Corbould for reviewing and helping us revise it into its final state. And last but not least, thanks to Saravana Kumar for publishing it. I had a really great time working with all of you. 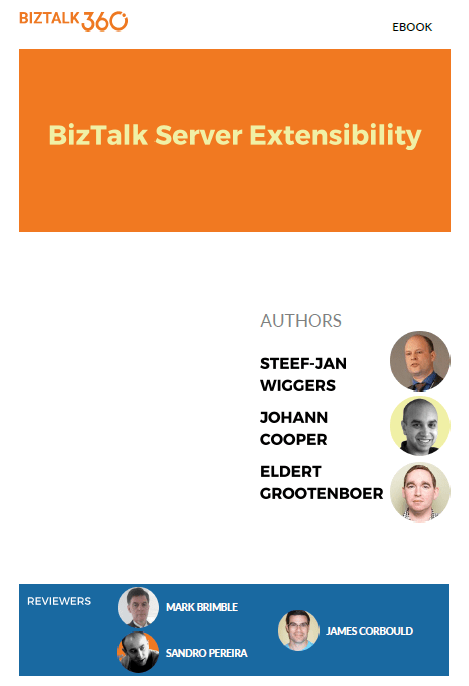 This entry was posted in BizTalk, E-Book, Extensibility by Eldert Grootenboer. Bookmark the permalink.